If you're looking for great birthday gifts for your clients to show how much you appreciate their business, you've come to the right place. Simply choose from several gift options for your clients and we’ll take care of the rest. We rotate different cards and gifts in each category to ensure your clients receive a new birthday package every year. All gift levels include the birthday card. Have us send a high quality birthday card to your clients for their birthday every year. We rotate dozen's of custom designed cards in the mailings so your clients will never receive the same card twice. If you're not doing anything to recognize client birthdays, here's a convenient and inexpensive way to get started. 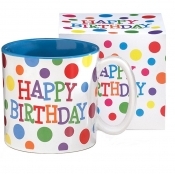 Dishwasher safe/FDA approved/Microwave safe.Happy birthday party brights mugs with colored polka dots all over. Ceramic. Microwave and dishwasher safe. 13 oz. Handwash only/FDA approved. 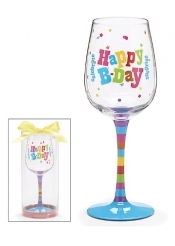 Wine glass with decal Happy Birthday message with hand blown hand-painted multi-colored stem with blue base. Individually boxed. 12 oz. 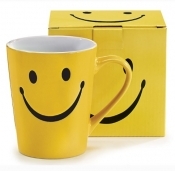 Put a smile on your client's face with this uplifting brightly colored mug. Dishwasher safe/FDA approved/Microwave safe. Ceramic. Microwave and dishwasher safe. 13 oz. amazing organization at www.missionmadejewelry.org . Impress clients with this relaxing smooth Jazz CD and birthday card. Its an elegant way to show your appreciation. Choose one of these gift levels and your clients will receive a custom birthday card and a rotation of high quality treats. All gifts are sealed in plastic for quality assurance and include ingredients labels. So whether its gourmet chocolates, specialty candies, fancy nut brittles, delicious toffees, or healthy nut clusters, you know your clients will open their birthday gifts with delight. The following gifts will be included in the birthday mailings thru March 31st. Includes the custom birthday card, $5 Dunkin Donuts Card. Postage is $0.85. We are proud to offer the Starbucks Card as an option for your client birthday mailings. Each mailing includes the customized birthday card and the Starbucks Card of your choice ($5, $10, $25 or $50). With approximately 10,000 locations in North America, the Starbucks Card is convenient to use and always appreciated. Postage is $0.85. $8.95 Includes the custom birthday card and $5 Starbucks Card. 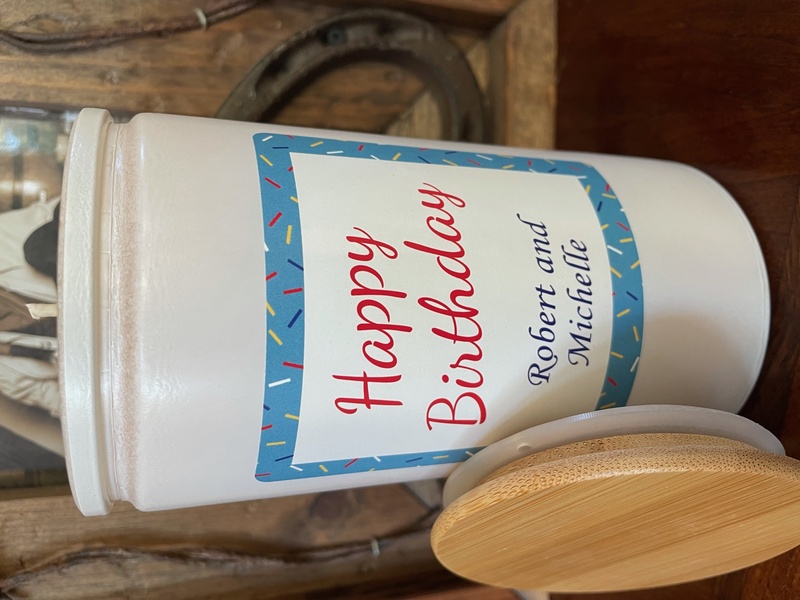 $14.95 Includes the custom birthday card and $10 Starbucks Card. $29.95 Includes the custom birthday card and $25 Starbucks Card. $56.95 Includes the custom birthday card and $50 Starbucks Card. $29.95 Includes the greeting card and a $25 gift card. $56.95 Includes the greeting card and a $50 gift card. $14.95 Includes the greeting card and a $10 gift card.